Let me speak frankly, even with Brexit and the fact immigration numbers will now be reduced in the coming years, there is an unending and severe shortage of new housing being built in the Bedford area (and the UK as a whole). Even if there are short term confidence trembles fueled by newspapers hungry for bad news, the ever growing population of Bedford with its high demand for property versus curtailed supply of properties being built, this imbalance of supply/demand and the possibility of even lower interest rates will underpin the property market. When the Tories were elected in 2015, Mr. Cameron vowed to build 1,000,000 new homes by 2020. If we as a Country hit those levels of building, most academics stated the UK Housing market would balance itself as the increased supply of property would give a chance for the younger generation to buy their own home as opposed to rent. However, the up-to-date building figures show that in the first three months of 2016 building starts were down. Nationally, there were 35,530 house building starts in the first quarter, a long way off the 50,000 a quarter required to hit those ambitious targets. Looking closer to home, over the last 12 months, new building in the Bedford Borough Council area has grown. In 2014/15, for every one thousand existing households in the area, an additional 13.39 homes were built. For 2015/16, that figure is now 13.95 homes built per thousand existing households. Nationally, to meet that 1,000,000 new homes target, we need to be at 7.12 new homes per thousand, which means Bedford Borough Council is actually above the National target, the problem is the country is only building at a rate of 4.9 for every thousand exiting households – we can’t just rely on little old Bedford to build for the rest of the Country. I am of the opinion Messer’s Cameron and Osborne focused their attention too much on the demand side of the housing equation, using the Help to Buy scheme and low deposit mortgages to convert the ‘Generation Rent’ i.e. Bedford ‘20 somethings’ who are set to rent for the rest of their lives to ‘Generation Buy’. On the other side of the coin, I would strongly recommend the new Housing Minster, Gavin Barwell, should concentrate the Government’s efforts on the supply side of the equation. There needs to be transformations to planning laws, massive scale releases of public land and more investment, as more inventive solutions are needed. However, ultimately, responsibility has to rest on the shoulders of Theresa May. Whilst our new PM has many plates to spin, evading on the housing crisis will only come at greater cost later on. What a legacy it would be if it was Mrs. May who finally got to grips with the persistent and enduring shortage of homes to live in. The PM has already referenced the ‘need to do far more to get more houses built’ and stop the decline of home ownership. However, she has also ruled out any changes to the green belt policy – something I will talk about in a future up and coming article. 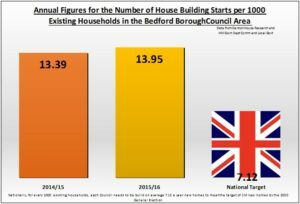 Hopefully these statistics will raise the alarm bells again and persuade both residents and Councilor’s in the Bedford Borough Council area that housing needs to be higher on its agenda.